Gateway to the amazing wonder that is the Ningaloo Reef, Exmouth is a tiny town on the coral coast of WA, a 15-hour drive (or 1,270km) north of Perth. A nature lover’s paradise with its coral reefs, colourful fish and whale sharks, the world-famous crystal clear waters of the Ningaloo Reef (which stretches 300km) is the reason visitors flock from all over the world to Exmouth but the whole region is drop dead gorgeous. The Cape Range National Park boats some pretty epic gorges and walk trails, while the crystal clear turquoise waters are hard to beat. Lucky enough to be visiting soon? Here’s how you should spend 48 hours in Exmouth. 5pm Flying into Exmouth is a magical experience (that coastline!) Make sure you hire a car at Learmonth Airport (you will definitely need one) and head into town, a 30-minute drive from the airport. There is a plethora of spots to stay in Exmouth town but the best is Novotel Ningaloo Resort. Located right on Sunrise Beach, the resort is the perfect mix of luxury and relaxed style, the stylish rooms are huge and comfy and the pool situation is divine. Plus there’s 24-hour room service for late night fries action. Yes! 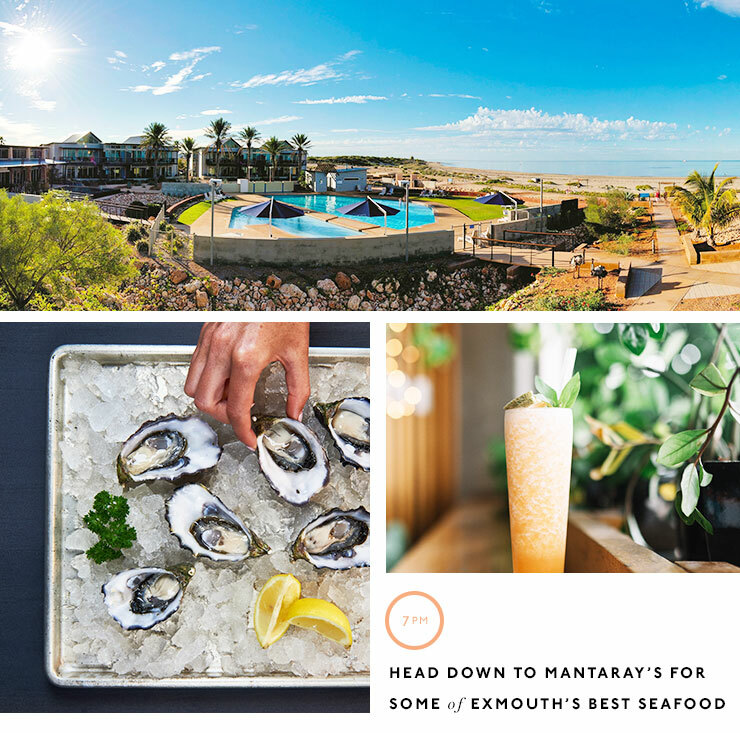 7pm Before you jump into your super comfy bed, head down to Mantaray’s, Novotel’s restaurant, which also happens to dish out some of the best food in Exmouth. Get in my belly delicious fresh fish! 7am If you’re up for some pre-caffeine exercise, walk the 20-minute route to The Short Order Local. 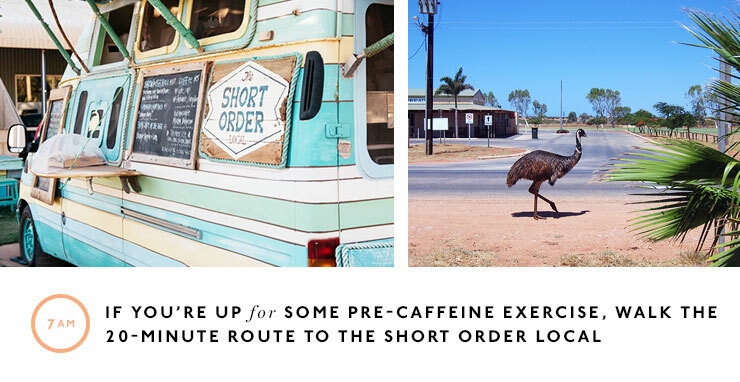 Located within the car park of the RAC caravan park, this food truck whips up some of the best coffee in Exmouth (they also do a bangin’ bacon and egg roll, FYI). Perch yourself on one of the rug-lined couches, read the paper and enjoy your morning brew. It’s a magical time of the day. 9am It’s brekky time and you’re ravenous right? Walk into town and head to SeeSalt, one of Exmouth’s best cafes. The coffee here is delicious and strong and the brekky menu is on point. The chilli eggs and bircher muesli are classic dishes, but if you’re starving (ie: you did the earlier walk I suggested), go for the big brekky—which will fill you up til lunch! Follow it up with a little stroll around Exmouth town and pick up a few lunch supplies for your beach picnic this arvo. 11am It’s time to put that hire car to good use and see some of that gorgeous coastline you came to see. Check out of Novotel and head north, stopping at Vlamingh Head Lighthouse for an Insta opp of some of the best coastline views in the area. Fun fact: this is one of the few places in Australia where you can watch the sun rise and set. 12noon Keep cruising for half an hour until you get to Turquoise Bay. One of WA’s best beaches, Turquoise Bay is the perfect spot to spend an afternoon relaxing, swimming and snorkelling. You can try the popular drift snorkel here by swimming out to the reef on the southern end of the beach, then letting the current wash you north to the sand bar. You'll see colourful coral and more than 500 fish species of fish in every colour of the rainbow. Eat your lunch goodies on the beach and think about how good life is right now. 1pm The road through the Cape Range National park ends at Yardie Creek—a speccy, multi-coloured gorge which provides a home to heaps of different bird species, along with black-footed rock wallabies and lots of marine life. There’s some walking trails along the top of the northern wall of the Yardie Creek gorge or you can kayak or jump on a boat cruise to learn plenty of interesting things about the local region, flora and fauna and history. It’s a must-visit! 2pm Are you ready to check into one of the most epic places you’ve ever stayed? 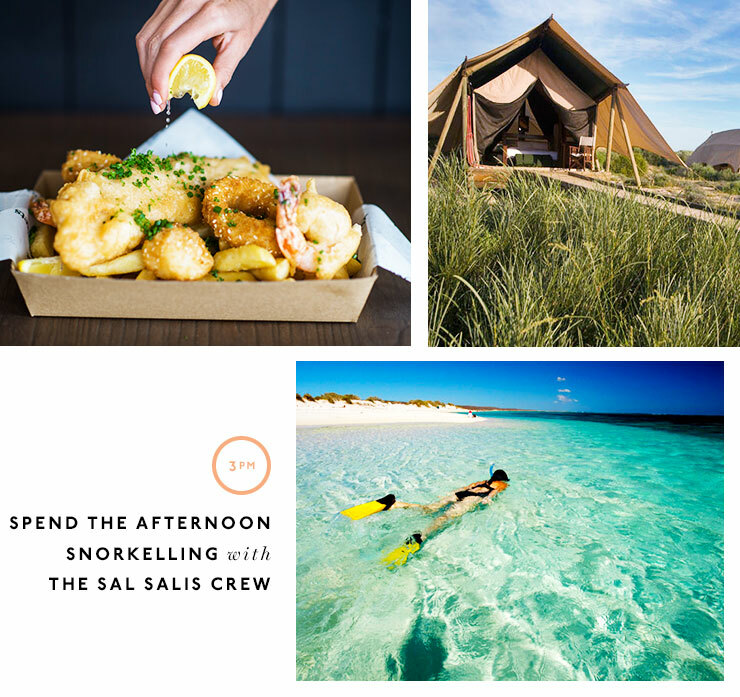 Sal Salis—an eco-camp located between the white beaches and blue water of Ningaloo Marine Park and the rugged red hills of Cape Range National Park—is all about a glamping experience with a minimal footprint. Each tent is built on a sturdy log frame on a separate timber deck, and has a veranda, a large room with a super comfy bed and an ensuite. The central tent is the hub of the retreat, with a communal table for meals, plenty of cosy nooks for curling up with a book, and a help-yourself bar—yes! The nine tents are all linked by boardwalks to protect the fragile environment and it will be one of the most special places you have ever stayed. 3pm If you didn’t get enough snorkelling action in at Turquoise Bay, join the afternoon guided snorkelling session with the Sal Salis crew. If the weather is good, you’ll get to kayak out to the Blue Lagoon—about 400m off-shore—and be rewarded with the clearest blue water you will every see and some of the most amazing snorkelling to boot. We saw an octopus, several reef sharks and so many different coloured species of fish. It was one of my favourite Exmouth moments. 6pm The incredible food will be one of the many highlights of your stay at Sal Salis. Drinks and canapes start at 6pm but don’t go too hard too soon, because you’ve got a delicious three-course dinner (with matching wines nonetheless!) coming up at 7pm. Enjoy the lack of phone reception, have a chat to your fellow glampers and fill your belly before you fall into bed listening to the waves crash on the beach. 8am Just like all the meals at Sal Salis, brekky is a delicious affair with a hot brekky accompanied by fresh fruit, cereal and pastries. If you go during winter, you’ll be treated to humpback whales breaching while you sip on your coffee. Bliss. 9am Join in on a guided walk through Mandu Mandu Gorge, located 2km behind the camp. The history of 30,000 years of human habitation in this area is slowly unfolding and walking through the gorge provides an opportunity to spot the black-footed rock wallaby. Plus there’s some epic views back to the coast and over the Ningaloo Reef! 11am It’s time to (sadly) check out of Sal Salis (don’t make me leave!) but also time to sneak a tour into your busy weekend. Depending on the time of the year and what you’re into, there’s some pretty incred tours in Exmouth. Take your pick from fishing, diving, swimming with whale sharks or humpback whales, turtle watching, hiking or kayaking. Be amazed at the natural wonders of the area! 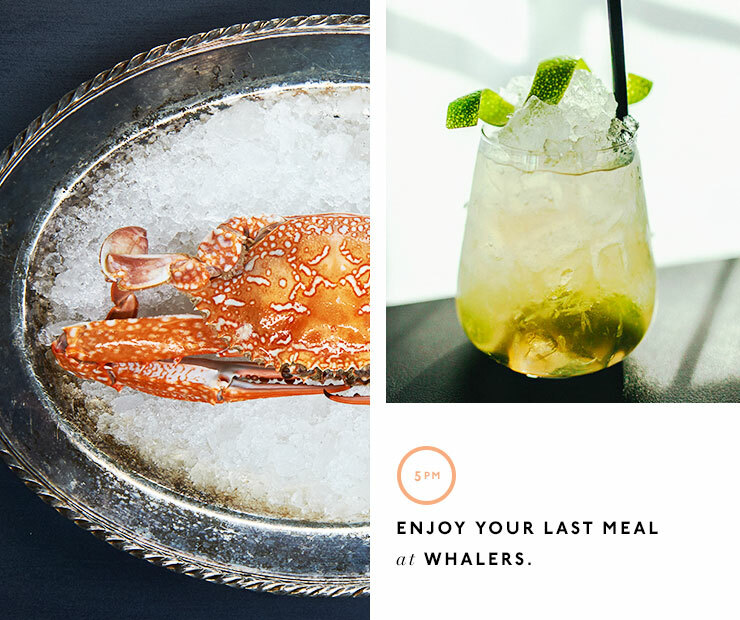 5pm One of Exmouth’s best restaurants, you can’t leave town without indulging in a meal at Whalers. The seafood, as expected, is where it's at here and you’ll have a hard time choosing between dishes like seafood gumbo, seafood spaghetti, reef & beef and the always tasty fish of the day. It’s all fresh, local and delicious. 7pm Your time is nearly up and it’s time to (reluctantly) head to the airport for your flight home. 'Til next time Exmouth! Exmouth has a dry and warm climate all year round with no wet season. Over the course of a year, the temperature typically varies from 12°C to 37°C and is rarely below 8°C or above 42°C. The hot season lasts from late November to late March with an average daily temperature above 35°C. The cool season lasts from late May to late August with an average daily temperature below 26°C. Hop aboard a Ningaloo dive tour to Lighthouse Bay, the Murion Islands or Navy Pier—one of Australia’s top 10 dive sites. Chase the ultimate big-game catches with a fishing charter. If you’re an experienced surfer, head for the reef break at Surfers Beach. If you’re visiting between March and July, don’t miss the opportunity to swim with whale sharks. Join a glass-bottom boat tour and view Ningaloo reef in comfort. 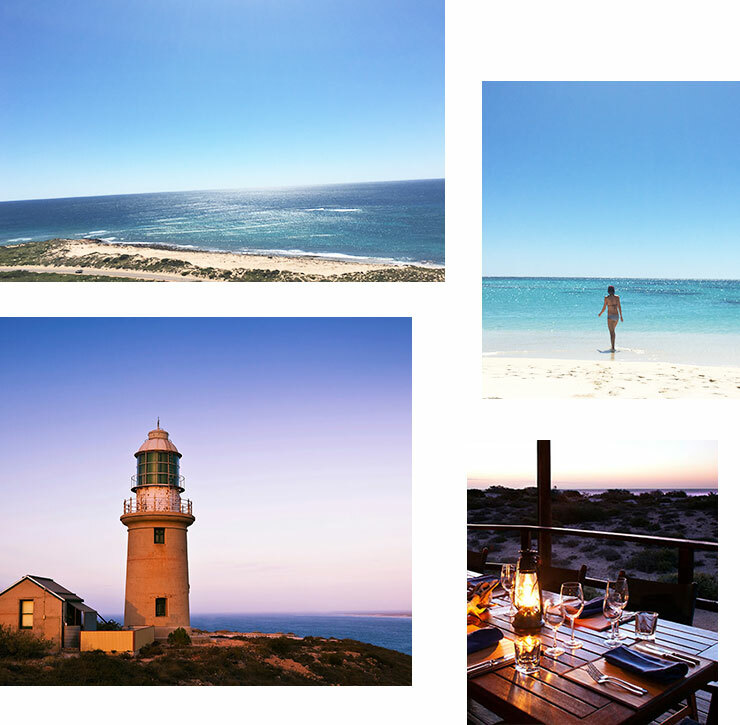 Discover the rugged beauty of Australia’s Cape Range National Park. Just 40 kilometres from Exmouth, it boasts some of the most spectacular gorges and canyons in WA, as well as amazing wildflowers, wildlife and 50 kilometres of pristine beaches. Take a cruise along Yardie Creek and be sure to keep your eyes peeled for the rare black footed rock wallaby. Watch the sun set over the Indian Ocean from Vlamingh Head Lighthouse. Learn about Ningaloo turtles at Jurabi Turtle Centre. Swim with the giant manta rays in Exmouth between June and November. Looking for more travel inspo? Check out how to spend 48 Hours In Tokyo!